Running your cursor across the image and see what happens. Spreading, spreading from the center, flowing on out to sea. And there is no way to stop them, once you’ve started the flow. But there’s little waves a-flowing, and there’s ripples circling yet. And disturbed a life that was happy where you dropped that unkind word. But there’s gladness still a –swelling, and there’s joy circling yet. A certain priest lay dying from a broken heart. Wagging tongues had ruined his life and work. A person, who had been one of the principal offenders, came to ask his forgiveness. "Father," she said, "I am sorry for my sins of slander against you. Is there anything I can do restore your good name?" The dying priest pulled out a pillow from under his feeble head and handed it to her, saying: "Go up into the church tower, cut open this pillow case and empty out all the feathers that are inside." The lady did as she was told. A strong wind blew the feathers in every direction. Then she returned to the priest. "Now," he said to her, "go out and gather up all those feathers and put them back into the pillow case." "But that's impossible," objected the lady. "The wind has blown them across the whole town." "That is just how impossible it is for you to get back my good name for me," said the priest. 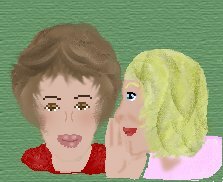 The Spaniards say: "Whoever gossips to you, will gossip of you." Italians say: "The tongue has no bones, but it can break your back." The Chinese say: "God gave a man two ears and only one mouth. Why don't we listen twice as much as we talk?"